This article was written by Sage Miller. Spread over more than 1,000 islands, the Maldives has been a popular tourist destination for decades and is usually discussed in the context of climate change. A low-lying archipelago, rising sea levels and the bleaching of coral reefs present dangers that have made it the perfect case study for the very real dangers that climate change presents. Headlines featuring the Maldives typically paint a picture of a country comprised of pristine white sand beaches, slowly sinking into the ocean. However, the past few years have seen the Maldives grow in importance as India and China continue to vie for dominant influence in the Southeast Asian region. As the two most prominent BRICS countries, China and India’s ongoing power competition is a staple of the international system. Their rapidly growing, powerhouse economies mark the two countries as rivals in the Southeast Asian region. China’s Belt and Road Initiative, its development strategy involving infrastructure development and economic investment in countries key to their economic growth, endangers India’s geopolitical influence in the region. As China increasingly pushes its Belt and Road Initiative and drives the battle for dominance in the area, power dynamics shift along with the domestic politics of the nation. Through incredibly small and often politically irrelevant, its location makes it a chokepoint of great geostrategic importance. Located off the coast of India, the Maldives is vital to any country that wishes to control the Indian Ocean. More than 100,000 ships carry natural resources and manufactured goods through the Indian Ocean. The Indian Navy commands the waters between Qatar, home to the forward headquarters of the United States Central Command (Centcom), and the Strait of Malacca, one of the most economically important sea-lanes to China which leads to the South China Sea, through which $5.3 trillion worth of goods pass annually. India’s ability to preserve its influence in the Indian Ocean has come to hinge on the Maldives due to the encroaching Chinese threat. The Maldives has traditionally been in the sphere of Indian political influence. Although relations technically date back centuries, they were formally established in 1966 after the Maldives declared independence. This changed in 2012, when President Mohamed Nasheed, the Maldives first democratically-elected president, was forced out by a coup and replaced with Mohammed Waheed, and then by Abdulla Yameen in another highly controversial election the following year. Bilateral relations between India and the Maldives became subsequently strained. Maldivian supporters of democracy saw Indian acceptance of this political crisis as a betrayal. This tension was furthered by the regime change itself. While Nasheed was traditionally pro-India, President Yameen drew the Maldives much closer to China. 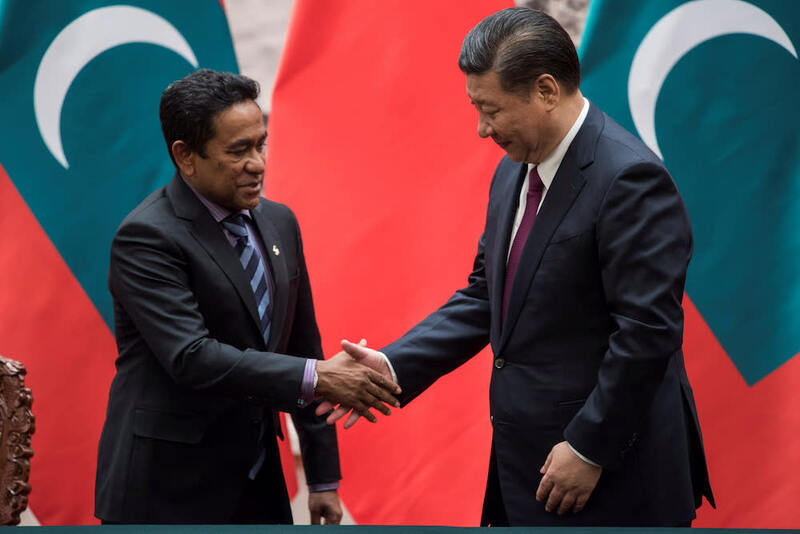 During his term, China stepped up involvement in the country’s infrastructure projects, aptly recognizing the Maldives’ worth as a key part of its Belt and Road Initiative and getting busily to work on expanding its influence from Asia into Africa and Europe through this country. It is building a 25-story apartment complex and hospital, and has invested $830 million to upgrade the airport and build a 1.3-mile bridge to link the airport island with Male. This ‘Friendship Bridge,’ launched in 2015, has come to symbolize the growth of Sino-Maldivian relations. In 2017, 21% of the Maldives’ tourists came from China. Simultaneously, relations with India worsened; in March 2015, Prime Minister Modi cancelled a visit to the Maldives over the treatment of former President Nasheed, who had been jailed for corruption. The Maldives declined India’s invitation to take part in its eight-day training exercise in 2018, and Yameen’s government rejected visa renewals for Indians legally working in the Maldives with no explanation. Indian suspicion grew as China solidified its hold over the Maldives through economic investment, slowly but surely integrating itself into the Maldivian infrastructure budget; Yameen’s endorsement of China’s new Silk Road Initiative and the docking of three Chinese naval ships in Male last August only invited further frustration as India grappled with the realities of being pushed out of the Maldives by China. 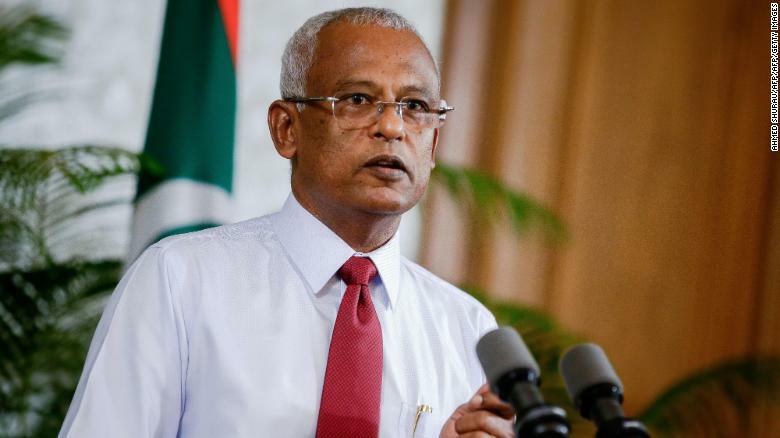 On September 23, 2018, the Maldives’ presidential election produced a surprising outcome, with incumbent Yameen losing his run against President-elect Ibrahim Mohamed Solih of the Maldivian Democratic Party. Solih is ‘considered an old-timer in politics,’ and his win was met with cordial congratulations from China, followed by defensive lashing out when it was suggested that Chinese development projects in the Maldives could take a hit from this development. India, meanwhile, has wasted no time trying to undermine this statement. In November 2018, it became public knowledge that India was considering a $1 billion loan to the Maldives – a political bargaining chip aiming to bail the Maldives out from any reliance on Chinese investment, as well as from Middle Eastern countries. At present, the Maldives is estimated to owe China around $3 billion; India’s offer is more meant to help the Maldives service the debt and gain influence simultaneously. Ultimately, the Maldives is caught between the two powerhouses of Southeast Asia, the recipient of geopolitical projects designed to leverage influence. The rate of change has been proven to be quick in the Maldives; 10 years ago China did not even have an embassy in Male, and it is now one of the Maldives’ biggest creditors. As India struggles to regain the influence it once held, it is becoming clear that the power competition is about to pick up the pace as influence in the Indian Ocean becomes increasingly vital to both countries’ security.